New year, new hair, new shirt. 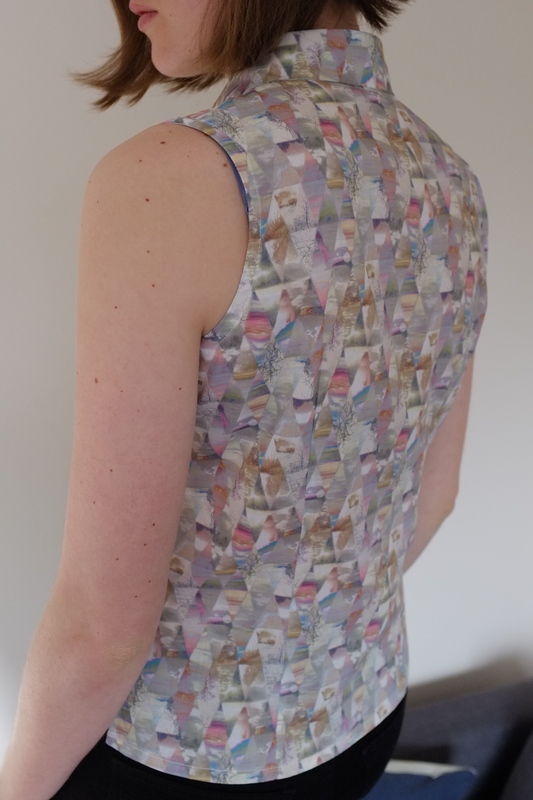 This sleeveless blouse is my first make in 2016, and the first thing that I can tick off my 2016 sewing list. This project started with a fabric I had sitting in my stash for a while. I bought this Liberty lawn back in November at Shaukat in London, a place I’ve been wanting to visit after reading about it on Katie’s blog. As expected the shop was overwhelming and it took me about an hour to settle on a fabric. While I love the quality of Liberty fabric I am not very drawn to cute florals so I was looking for something more abstract. In the end I chose these two pieces. I was drawn to this Liberty lawn because of its colours and the geometric pattern. I knew I wanted to make a top and first thought of keeping the shape simple to let the fabric stand in the focus. But for some reason I couldn’t really picture it and I let the fabric sit in my stash untouched. 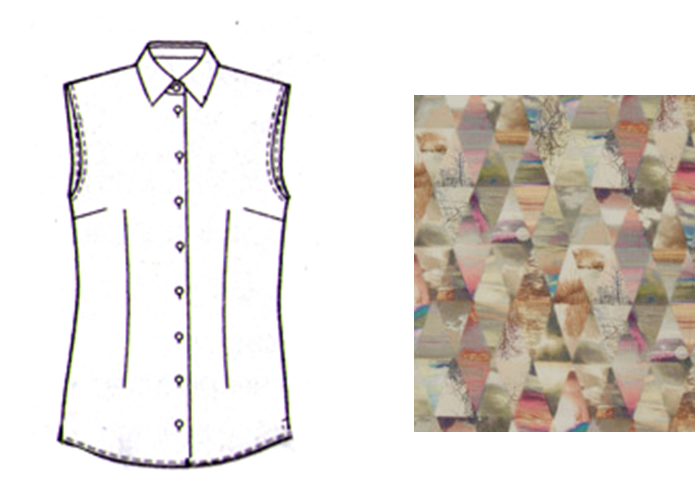 Then one day I had an epiphany and knew I wanted to pair the fabric with a structured, sleeveless blouse. Isn’t it weird how ideas sometimes come out of the blue? Now that I was settled on what I wanted to sew I was looking for a good pattern. In the end instead of buying one I decided to give myself a challenge and copy a shirt from my closet. While I love how indie patterns guide you through each step of constructing a garment, it’s sometimes nice to figure out on your own how to put a garment together. I traced the pieces off the shirt with some tissue paper. This process can be quite tricky off an intact garment but I took my time and it worked out allright. As I liked the fit and the style of the original shirt the only change I made to the pattern was to draft a less pointy collar. 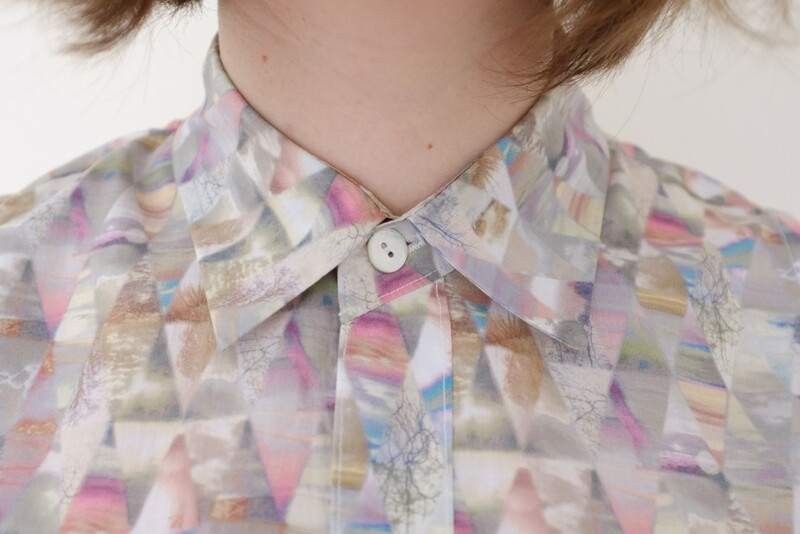 The construction was pretty straight forward, it helped that I recently had made a shirt, and for the collar construction I used the instructions of another blouse. I serged the seams instead of doing French seams, for one because I need to practice with my new overlock and second to be able to construct the split hem. The button band on the one side is just folded over, on the other side a separate button band is attached. 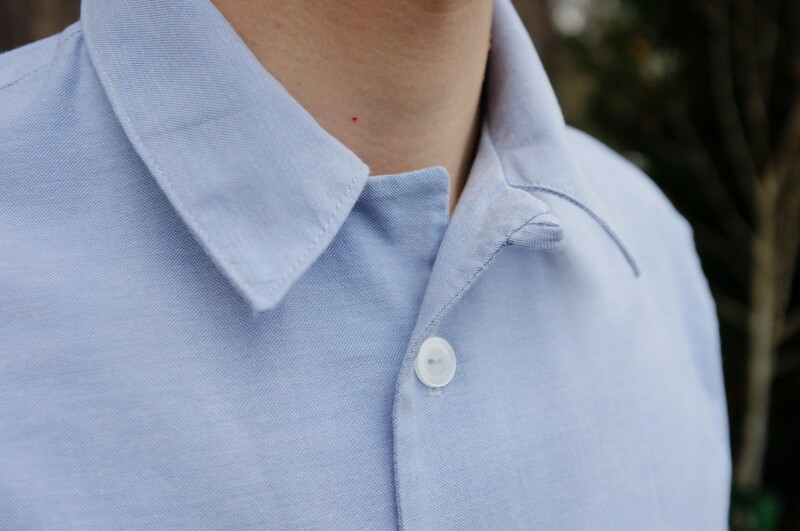 This is a feature of the original shirt and I quite like it. The only thing that went slightly wrong was the angle at which the collar stand is attached to the button band. It should be at a right angle but it obviously isn’t. I’m not quite sure what happened there, but I’ll just call it a design feature. It does get lost in the busy print anyways. The armholes are finished with a white satin bias tape, which was quick and simple but looks nice. The finished shirt looks pretty much how I envisioned it. 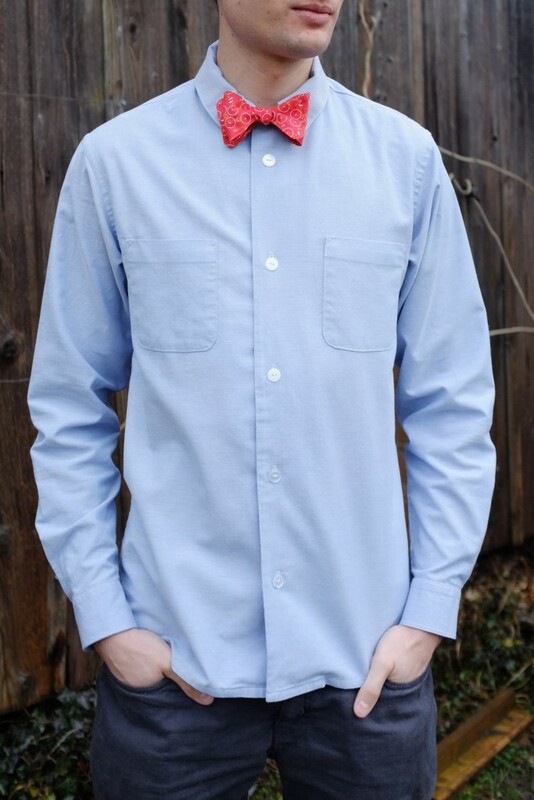 I especially love the crisp collar. I am a little bit unsure if I really like the look of sleeveless shirts on me. My boyfriend tells me I look like a cleaning lady or a wrestler and I have to admit there is some truth to it. In the end it’s not a big issue though as I am planning to wear it to work layered under a blazer or a jumper. In a future version I might play with the shape of the armholes a little bit to give it a more modern look. The overall fit is actually pretty good. There are some issues with wrinkles at the shoulder seams and I might lower the armholes slightly in the future but these are just minor issues. The bust darts and fisheye darts in the back give it a slightly fitted shape. Thanks to the split hem there is enough room around the hips, which is great. 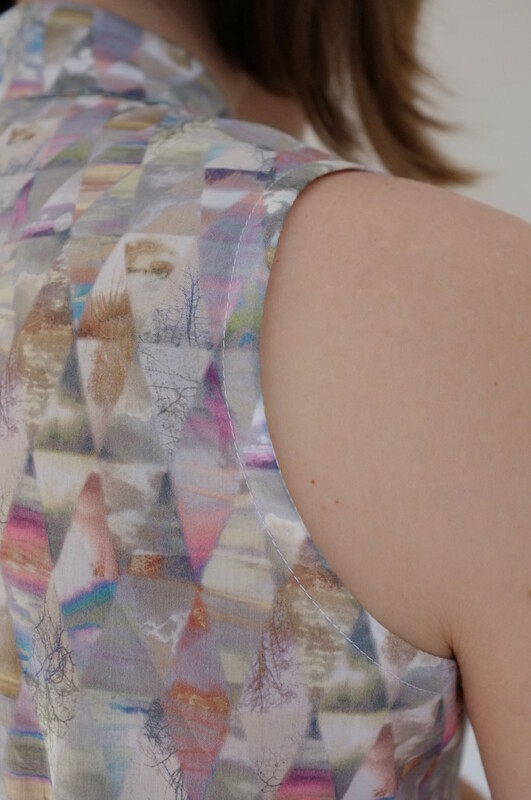 I love the look of a split hem, so I might add this detail to more tops in the future. Overall this project was a great start into the sewing year 2016. My next project will probably be something made from the Japanese fabric that arrived today. It was my first time ordering from Miss Matatabi and I am in love with the pieces. Beautiful fabric is alway the best inspiration! My brother turned 30 this year. For this big occasion I decided to sew him something. And what could be more classic than a shirt? As always with these ideas I decided on it just before his birthday and there was no time to sew it beforehand, also I first had to take the measurements and decide the design with him. So a voucher it was, given to him in April. It took another 8 months to finish it. First we had to decide on the pattern. 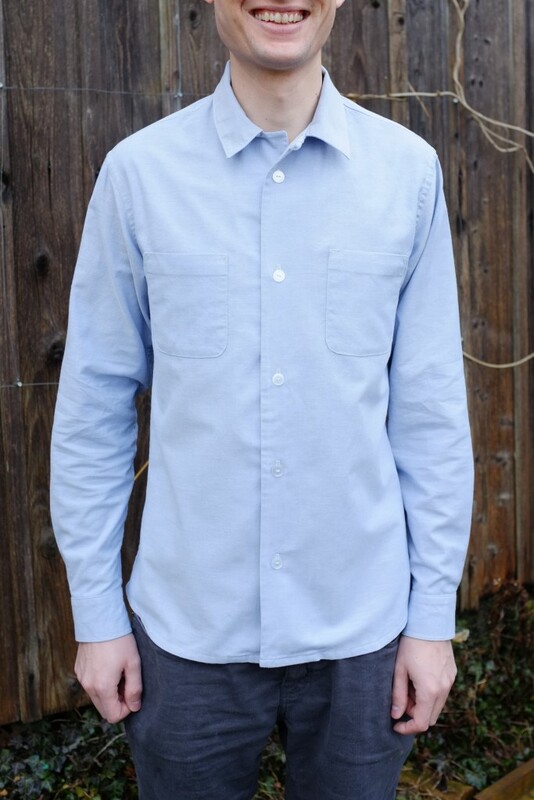 I suggested the Colette Patterns Negroni shirt, as it was the only indie pattern for a men’s shirt that I was aware of. As I couldn’t see my brother for his birthday we took the measurements when he visited me in the UK a couple of months later. Then I had to find a fabric. Originally I wanted to make it from plaid fabric but I couldn’t find a fabric that I liked so in the end I opted for a simple light blue chambray. Since my brother lives in Germany I had to wait for my visit in August to show him the fabric in person. He approved it and finally I could start sewing. In theory… In reality life was incredibly busy last autumn, and I only managed to fit in an hour here and there. To make sure it would get done I had to set myself a deadline for Christmas and I just about managed to finish it. The last stitches were done on the way home for Christmas. My brother is tall and slim and I expected to have to make some adjustments to the pattern. Surprisingly his measurements fell straight into size S. When I checked his arm measurements against the flat pattern I realised that I didn’t even have to lengthen the sleeves. After reading some pattern reviews it became clear that the sleeves are more on the long side, which was ideal for my brother. Design-wise I only omitted the pocket flaps to give it a cleaner look. 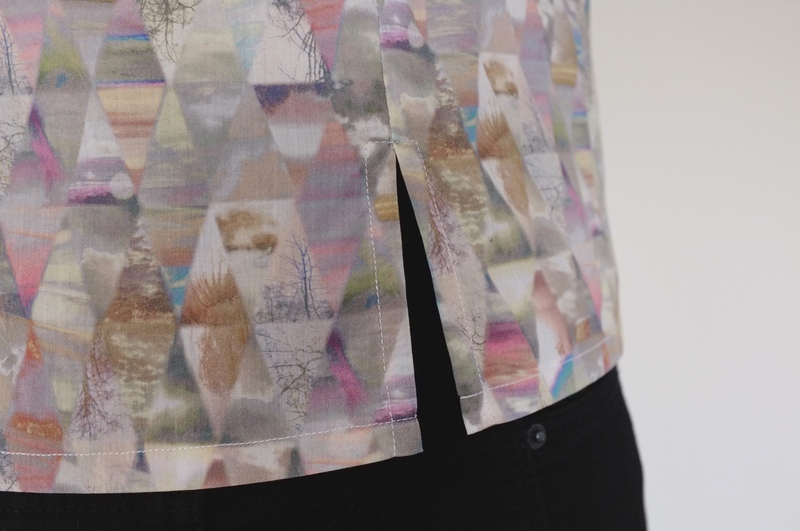 When I finished it up the shirt looked very slim and I was afraid that it would be too small. With the flat felled seams I also didn’t have the possibility to let it out to make it bigger. 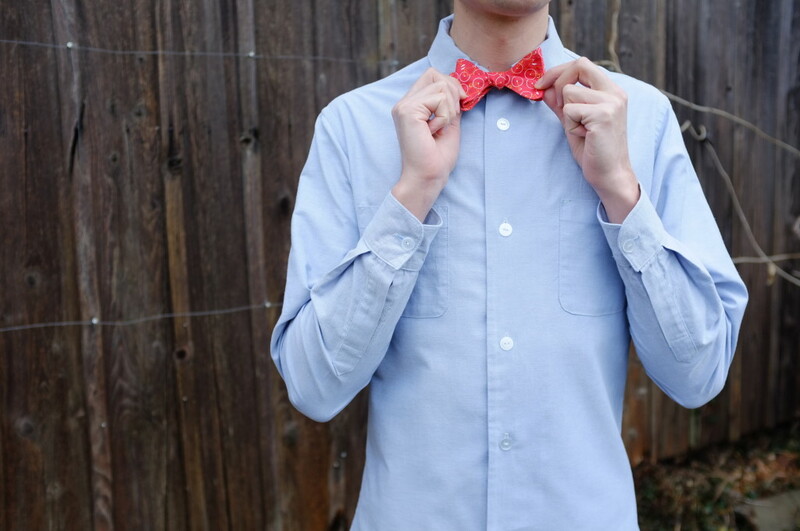 It was therefore quite nerve-wracking when he put it on on Christmas Eve. Luckily it actually fits really nicely on the body and the sleeves are just long enough. The construction was quite straight forward. The instructions are very thorough and clear and I didn’t have to unpick even once. The only thing that I didn’t understand was how the button loop at the collar could work when facing upwards so in the end I decided to move it to the side. 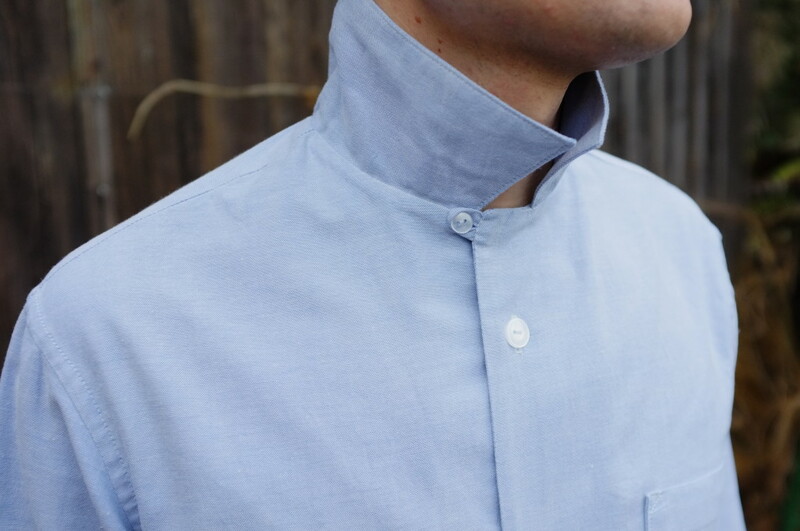 The vintage collar looks a little bit strange when closed but my brother will wear the collar open anyways, so that shouldn’t be an issue. 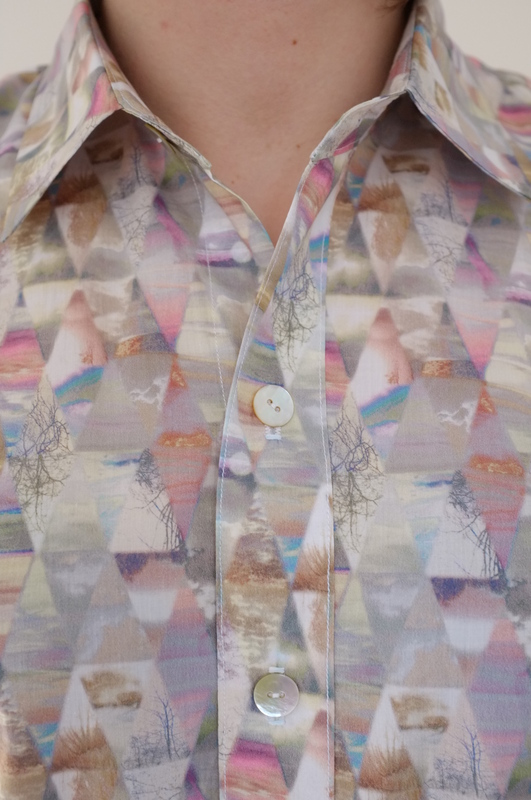 I struggled to find nice buttons for the shirt, in the end I settled on clear plastic ones as they looked most neutral. Their size together with the wide spacing from the pattern, however, make the shirt look a little bit like pyjamas (my sister’s words). I might change them if I can find nicer ones. Overall I think the shirt turned out nicely. 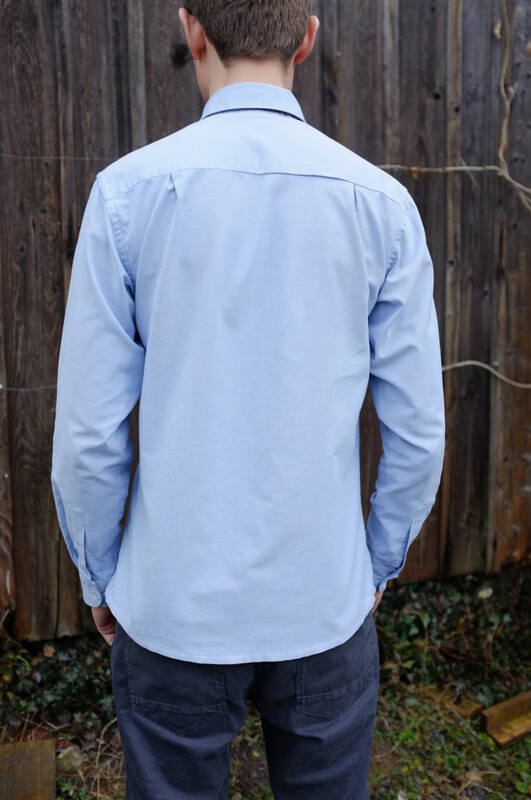 I really enjoyed learning new techniques such as the “burrito” method for attaching the yoke to the shirt or flat felled seams (which are not as difficult as expected). It definitely helped to break up the project into little chunks to be able to focus on one detail at a time. 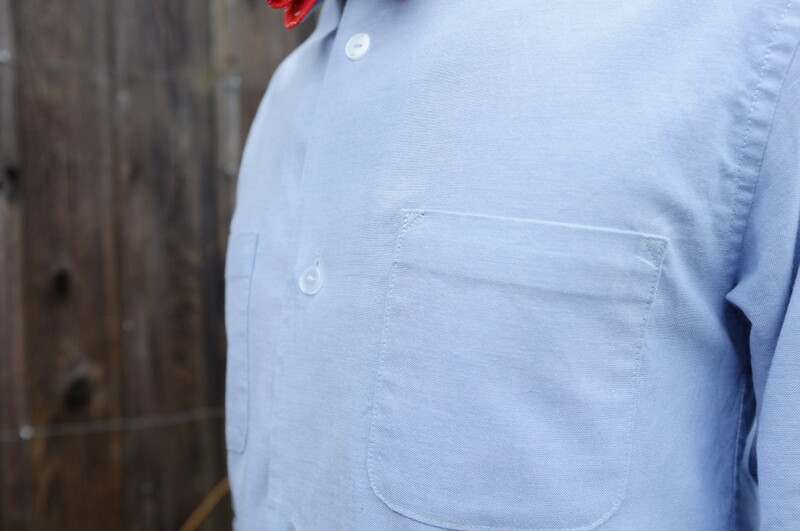 One thing I am particularly happy with is my first sleeve placket ever. 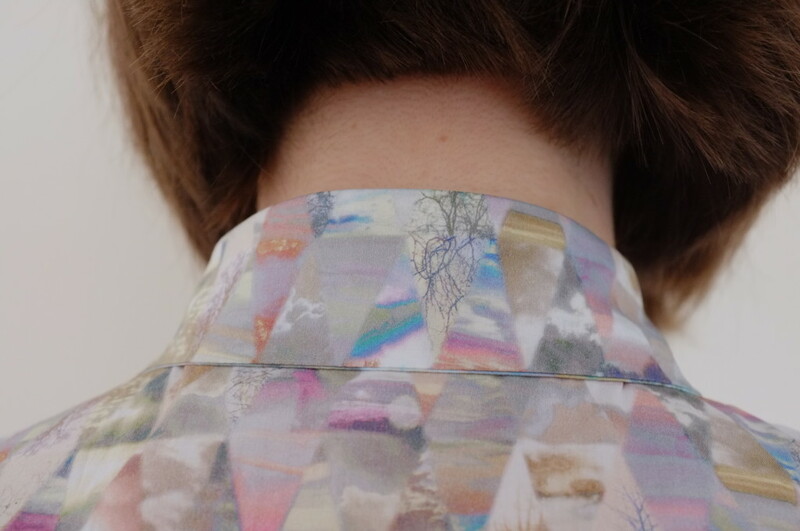 As the fabric is rather boring I new that I wanted to personalise the shirt a little bit. 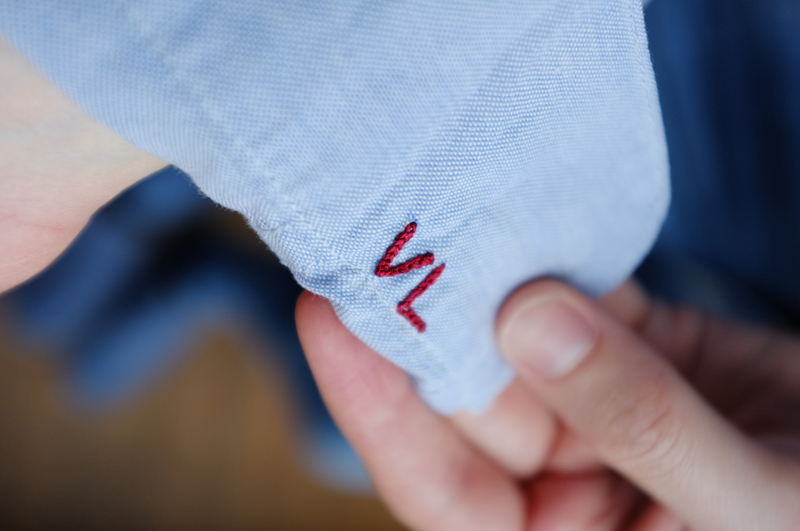 I decided to embroider my brother’s initials on the inside of the cuffs and added a little message to the inner back yoke. It was my first time to do embroidered lettering and I had to try a couple of different techniques to find one that worked well. 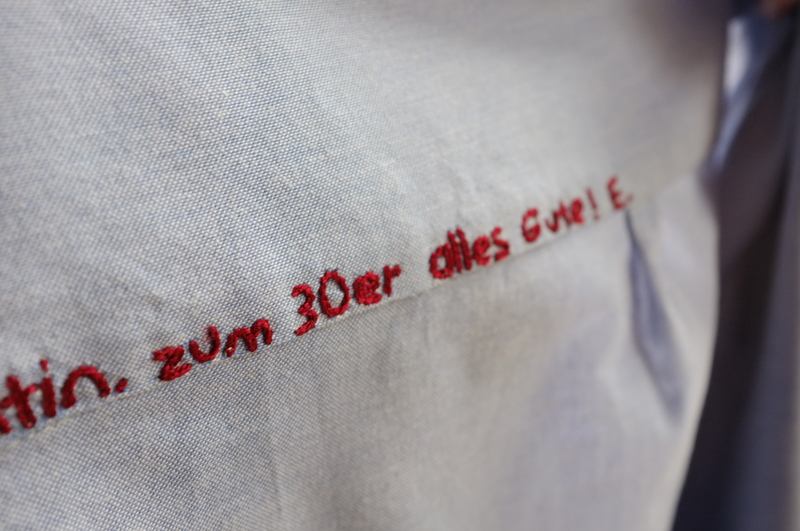 I finally settled on a chain stitch which might not look 100% professional but at least the embroidery is readable. As I didn’t know if I would have time to actually do the embroidery I added it last minute to the finished shirt which made it quite fiddly. It also didn’t help that I didn’t have embroidery thread and had to use 6 strings of normal sewing thread. On top of that I finished it off on the bus and at the airport, which is definitely not the best place for crafting. In the end it turned out allright and I love that it is on the inside of the shirt, a secret message for the wearer. All in all this was a really nice project. 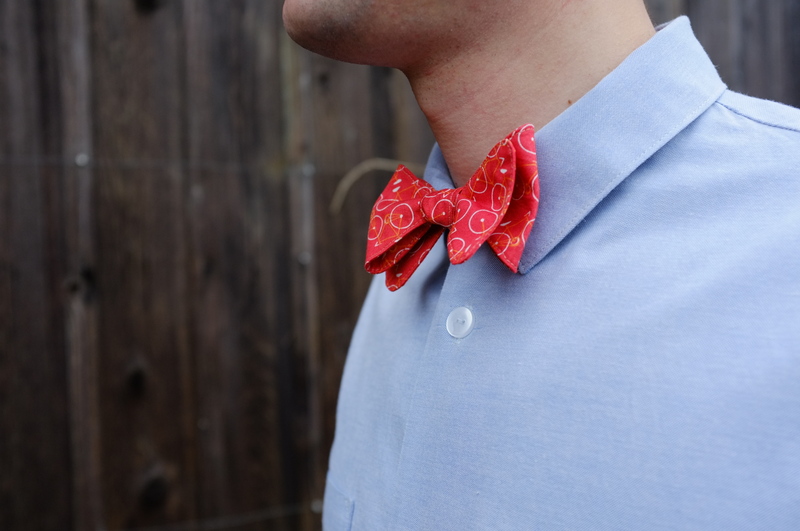 The collar without a collar stand and the simple botton band make the Negroni a great pattern to try out shirt making. 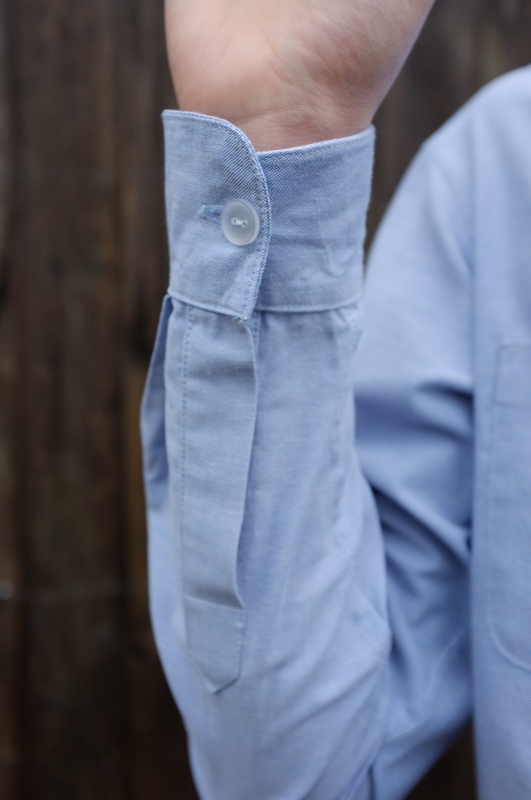 I’m sure I will make more men’s shirts in the future. 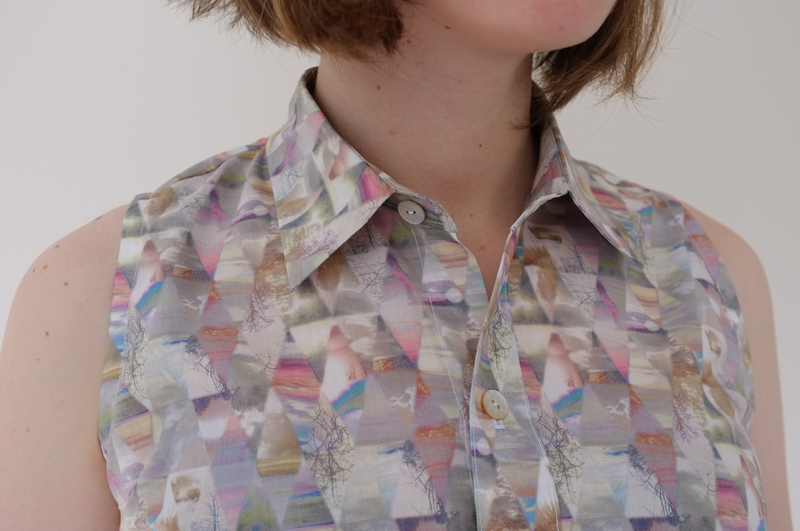 Next I would like to try a more classic shirt pattern. 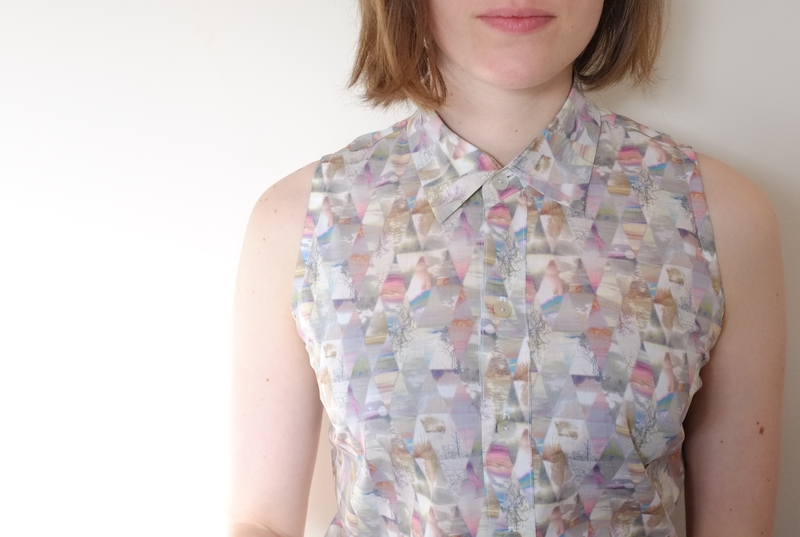 I already ordered this Burda pattern and might make my boyfriend a shirt for work. First I will have to hunt for some nice fabric though… Happy sewing! I love reading other people’s year reviews and sewing plans. Given that I started this blog in September, a full 2015 review would be too much but I want to take the opportunity to reflect on my sewing progress. Overall I had a very productive sewing year with a lot of firsts: jeans making, quilting, bra making (yet to be blogged) and men’s wear. The biggest lesson was that nothing is really scary and can be achieved with patience and good research. 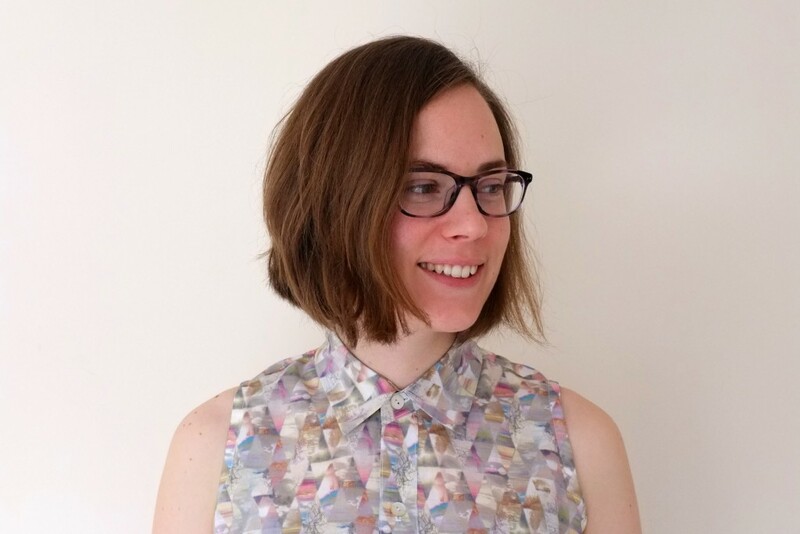 I am also really happy to have joined the online sewing world with this blog and Instagram after years of only “consuming”. I started this blog on a whim, without a concrete vision or goal but it’s been great so far. I haven’t had the time to be very active online (with little free time sewing always wins over blogging/networking/commenting) but I am not really bothered about it. As long as I have my little corner to document my sewing projects I am happy. Surprisingly I am really enjoying the writing part of blogging and writing a blog post is always fun and never a chore. I really hope it stays that way. For 2016 my main goal is to consciously set aside time for sewing. With my desk-based and often rather stressful job sewing is the best activity to help me unwind and recharge. Dressy trousers: Now that I have the perfect jeans pattern (the Gingers) I want to work on a trousers pattern for my work wardrobe. This is really a gap in my wardrobe. I have made a pair of dressy trousers before but I am not really in love with it. I wear trousers most of the time and just can’t find any that fit in the shops (either they are too short or I am in between sizes). It will thus be worth spending some time on the fit to develop a perfect trousers pattern. 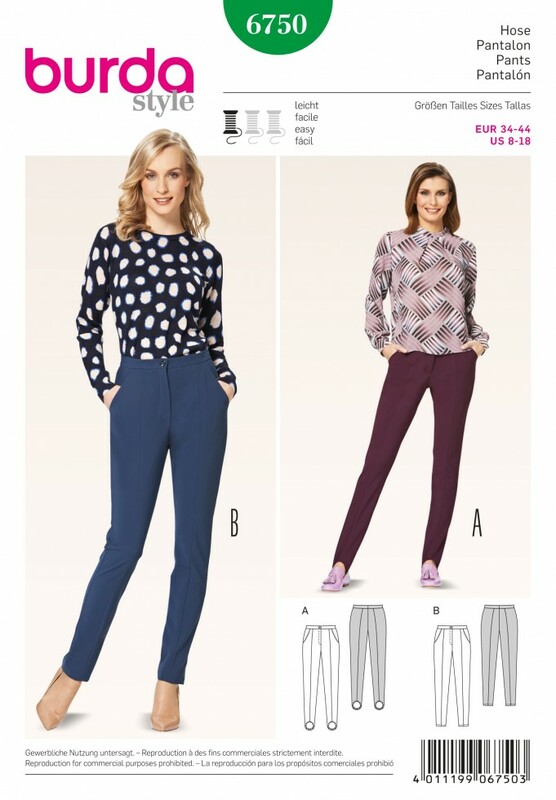 As a starting point I will use these Burda Slim Fit Trousers. Linen biker jacket: I have a lovely cream herringbone linen in my stash which would be perfect for a light summer jacket. I love cropped biker style jackets and after making one in black denim two years ago I want to make another one in a lighter colour. 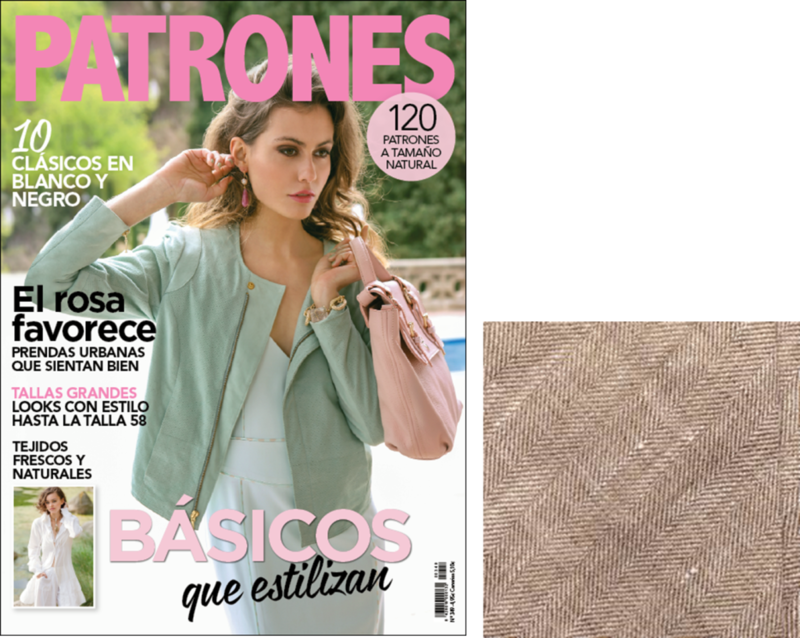 For the pattern I would like to try out the jacket on the cover of the May 2015 Patrones magazine (sadly I can’t find a technical drawing online). A friend brought me back the magazine from Spain and I was amazed by how many great patterns were in this one issue. I have never made anything from that magazine before and the instructions are very short (similar to the BurdaStyle patterns). I am not too worried though as I have made a similar jacket before and I am sure I will be able to put the pieces together in a logical order. For contrast I would love to add a colourful lining. Fancy summer dress: This year I am attending at least two summer weddings and it’s time to sew a new dress. I don’t wear a lot of dresses in my daily life and am always happy when I have an occasion to sew one. Both weddings will probably be rather casual so I’m aiming for something pretty but laid back. 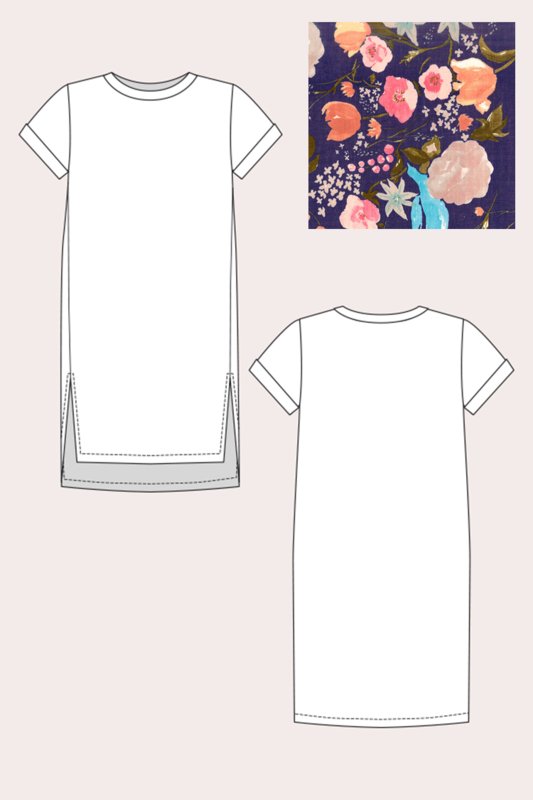 My favourite idea so far is to pair the Named Inari Dress with some Nani Iro fabric. If this combination sounds familiar, I totally stole this idea from Ingrid, I loved her dress so much! Sleeveless shirt: When I started working I was in desperate need of blouses and tops to wear for work. 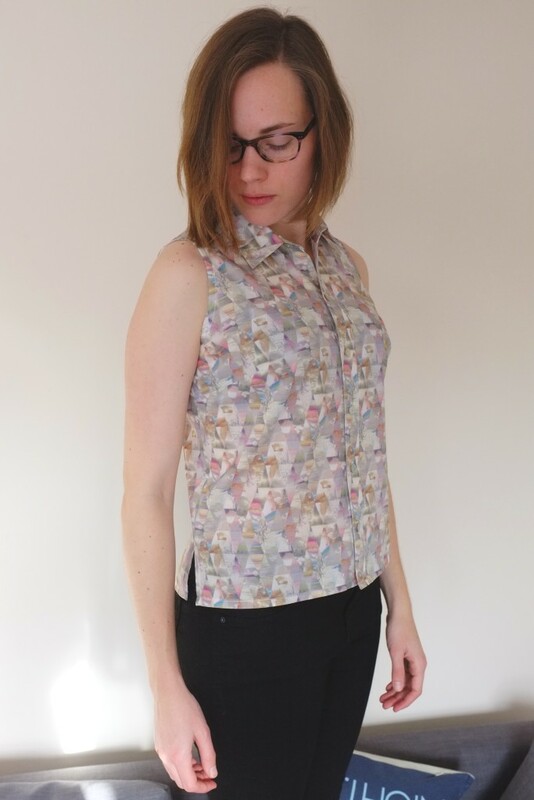 I have made several tops that I really like but one thing I realised was that tops with short sleeves just don’t work under blazers and cardigans. I hate that they bunch up at the neckline and that every time I go to the bathroom I have to make sure they sit properly. The solution? Sleeveless shirts. I bought a Liberty lawn at Shaukat (it doesn’t seem to be available online) when I was in London a couple of months ago without a specific project in mind. After contemplating for a while what to do with it I suddenly realised that the fabric and a sleeveless shirt would be a perfect match (at least in my head). 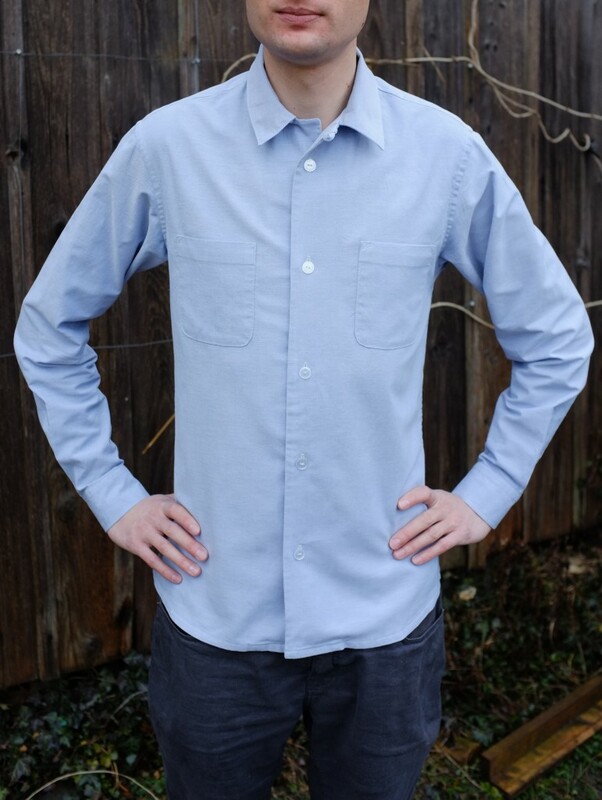 For the pattern I have already traced a ready-to-wear shirt, quite similar to the Vogue 8772 pattern shown below. Swim suit / bikini: For the first time in ages I have booked a beach vacation. I can’t wait for the two weeks in Southern France this summer! This also means that I finally have a good reason to sew swim wear (not a priority in the British summer), which I have never done before. I am contemplating to try the Cloth Habit Watson Bikini, the Lily Sage & Co Splash Swimsuit or the Reno Bikini Top from Seamwork Magazine. Winter coat: I originally wanted to make a coat this winter but I didn’t find the time nor the right fabric. 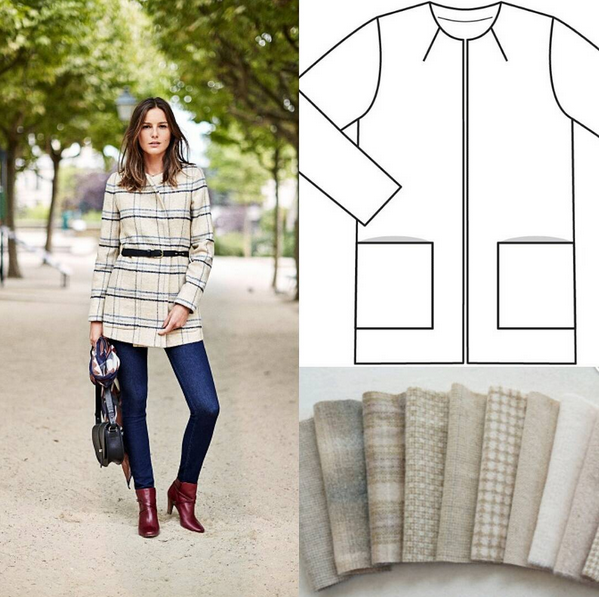 I would like to make a wool coat with a simple silhouette; something like the Sézane coat below (I don’t think it is available online anymore). I will keep my eyes open for the right fabric and I will probably use a BurdaEasy pattern. Hopefully I can start the project in fall to get excited about winter. For now I don’t mind moving the project to the end of my sewing queue. That’s all of my concrete sewing plans for 2016. I am sure that I will do a lot of spontaneous sewing on top of that. It will be interesting to see how many of these projects I will actually sew up. I hope you all have a creative year 2016!